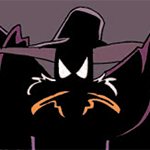 The Old Haunt: A Darkwing Duck Forum Main Menu Negaduck's N00b 101 I have returned! You may proceed with your demonstrations of both relief and horror depending on your view point. I am the hatchling that flies in the night. I am the yolk on the face of crime.